As I reported on Twitter in 140 characters or less: I tried sump’n new this week. 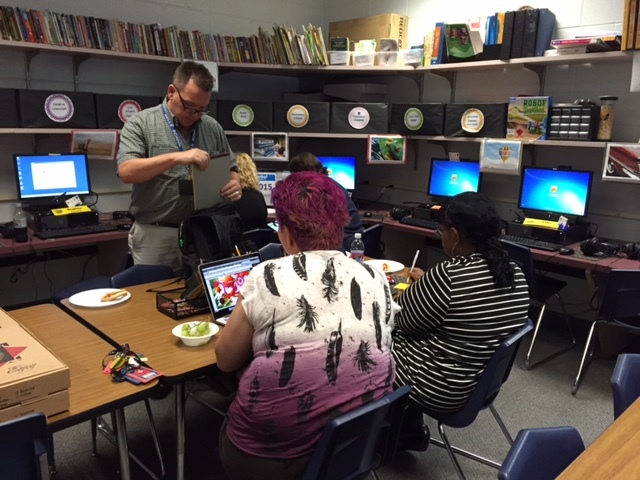 I hosted a little very informal, very unstructured, and very welcoming event which I dubbed a “Tech Playdate”. It was pretty much a Professional Learning Community in disguise, but we had too much fun to even realize that! 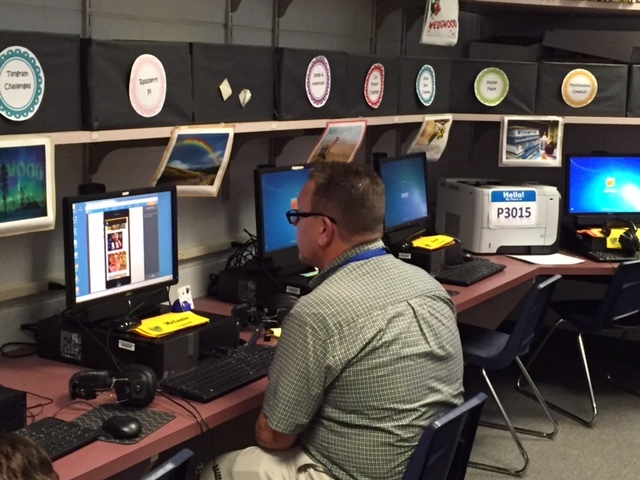 I’m always looking for new ways to get teachers excited about Purposeful And Relevant Technology Integration (PARTI). I’ve tried PD sessions during the day, little after-school workshops, putting resources online, and even stopping into classes to see if I can help facilitate lessons with tech. This time, the goal was different, and it was simple: provide lots of food, invite lots of people, make it as unassuming and casual as possible, don’t call it professional development, DON’T have a presentation or agenda, and let the people in the room dictate what happens. Oh, and have it after school, for no stipend or reimbursement, no credit…and just see who is curious or ambitious enough to come. The approved invitation was sent out to all seven elementary school principals, and from there it was sent out to staff. I asked for an RSVP for this one (because pizza was involved), and about 20 people said they’d come! I was pretty elated with that response, as this was a great unknown and it involved after-school travel for many. The turnout was accurate! We had 20 people, representing six of the elementary schools and two administrators. For a first try, this was not only impressive, but a revelation. Clearly, there is a desire for folks to learn & explore ed tech, and evidently informality and choice are critical components. Teachers are craving this. The photo above was the most critical part of planning the Tech Playdate. It couldn’t be a “sit & git” presentation-style PD session. There would be nobody at ‘the front of the room’ …no presenters. I really wanted it to be participant-driven, where everyone was invited to share or learn, and there was no fear in asking questions – any questions. I set up these three posters on a table and put some sticky notes nearby. I suggested that attendees fill out a note and try to find a ‘sticky-note buddy’ that matched their needs. There were knowledgeable people in the room who were empowered to share what they knew, and there were people (myself included) who just wanted to try learning something new with someone else. 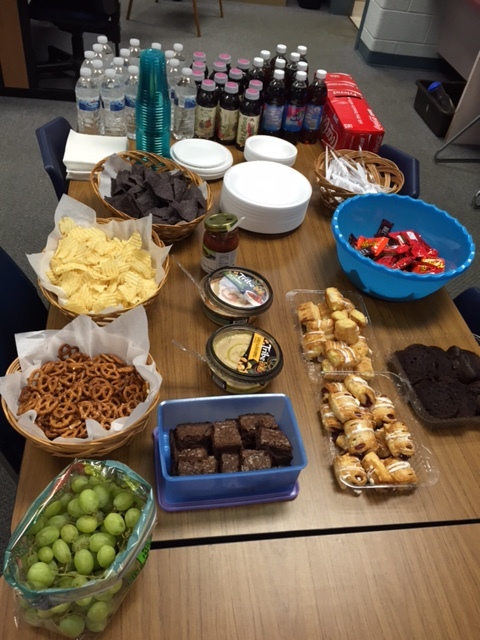 All kinds of beautiful sharing and learning ensued….it was collegiality & collaboration at its best! 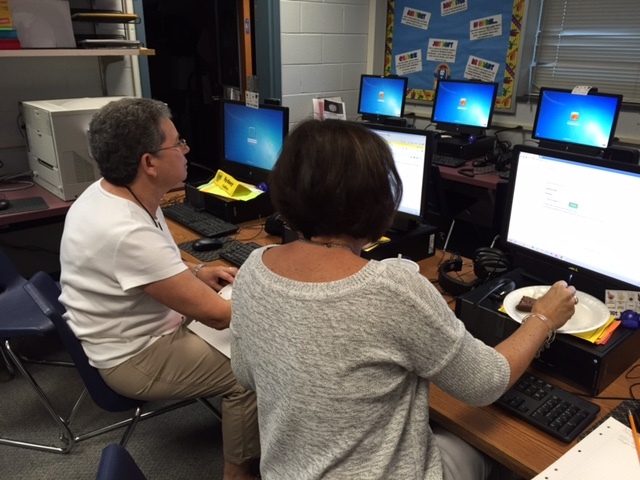 Alicia (left) learned about Plickers at our summer technology institute. She became the expert, and was more than happy to teach Kelsey all about it! Alicia was ready to share all kinds of wonderful things that she learned during the summer and had since been trying in her classroom: draggo, Quizizz, Google Forms, and more! These two ambitious teachers wanted time (How often do we hear that?) to work on their teacher pages on the school website. 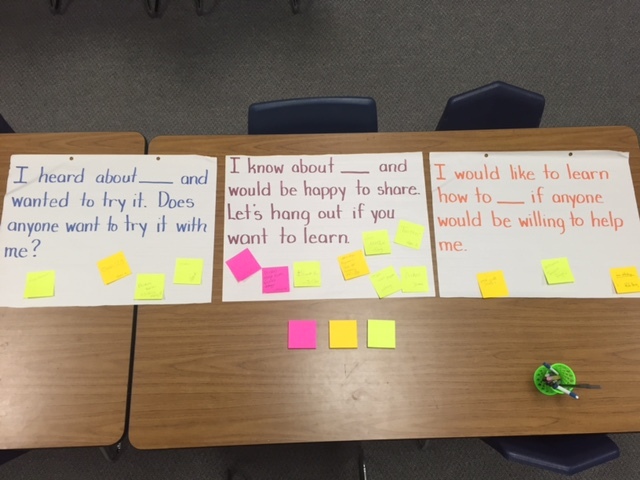 They both liked just being in a room where there was support and other people with the same questions…and their teacher pages are really awesome! These ladies were amazing in their zest to learn new things! They not only supported each other, but asked a ton of great questions and we all learned new things from their questions. Together, they explored a site called Curriculet so that they could develop great Reading lessons for their classes, but then they wanted to know more from people in the room: how to take screenshots and edit them, how to make word clouds, and how to earn Ed Tech Digital Badges that are now used in our district! Mary heard about Plickers, too, and James was more than happy to teach her about it! She had time and support to set up all of her classes, create folders, and start to set up questions. By the time she left, Mary had an activity she could use the next day. One teacher came ready to share all about a site called GoNoodle, but didn’t get a chance during this first Tech Playdate. Hold that thought for next time. Another teacher didn’t get the opportunity yet to show people about coding with kids, and someone else is still willing to teach about Symbaloo! Great! It looks like we have an awesome starter list for next month! Ambitious Rich came with the hope that he could learn web design! Luckily, there was someone in the room who was willing to share all about a site called Weebly, which allows for very user-friendly, very beautiful website creation! Linda’s sticky-note just said that she wanted to learn how to ‘work with pictures’. She was interested in learning how to upload, crop, edit, and get creative with her photographs. Lo and behold, there was someone in the room who knew that, too! This time, it was my brilliant friend Meredith Martin from a neighboring district, who”‘crashed the tech playdate” just because she loves this kind of learning, too! 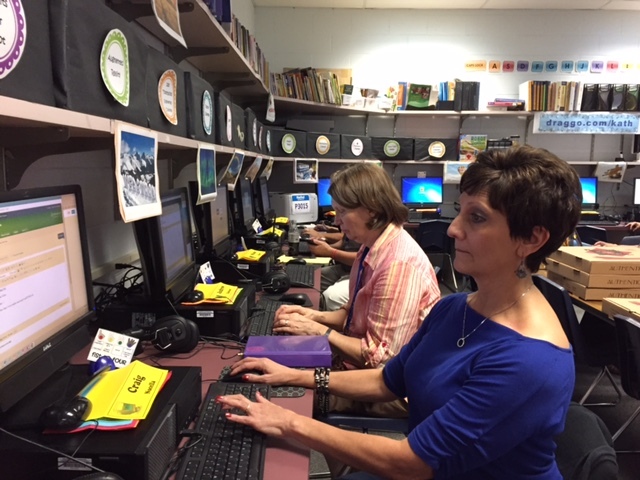 Linda and others got some very cool lessons on how to use Sumo Paint! You know it’s a REAL playdate when the principal comes to play! TBH, for our first Tech Playdate, this might have been part of the lure. This plus seven pizzas. I wanted to have a very homey and welcoming feeling for this first one, so – uh – food! The gang decided that now that we’re all friendly, techy buddies, we’re going potluck for the next one! Everyone’s bringing a treat to share with the class! Oh, and everyone’s bringing other colleagues who will enjoy a Tech Playdate, too! This thing’s going viral, and I hope that this kind of informal, free, no-accountability, exploratory, collaborative, playful learning becomes the ultimate ‘computer virus’! 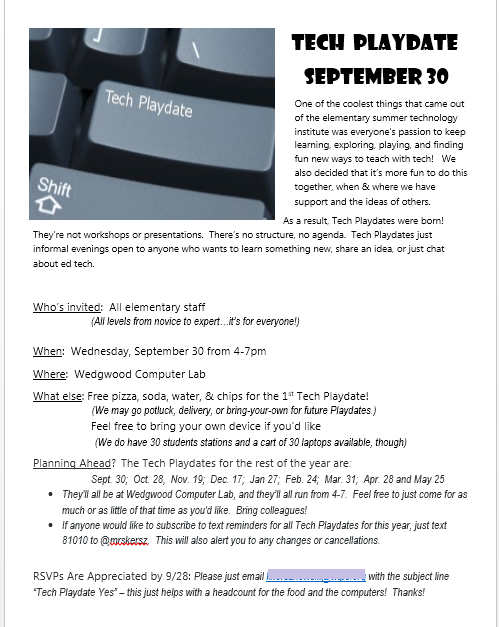 For local friends: The next Tech Playdate is October 28 from 4-7. No RSVP needed. « Having a Little Trouble, Eh? This was an awesome learning opportunity!! 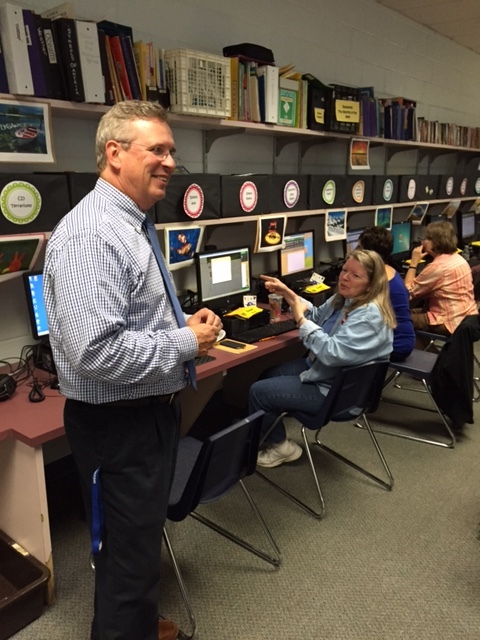 The spirit of collegiality and cooperation present in this computer lab was amazing!!!! Thanks Kathy for making this happen. You are a true dreamer who makes her vision come to fruition!! 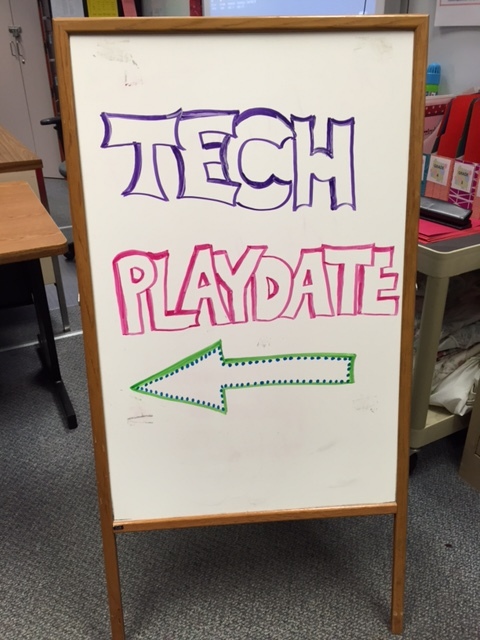 Looking forward to the next Tech Play Date!! It’s not a playdate if nobody shows up! All I did was provide a venue. It was a success because of the exemplary teachers like you who continue to go above & beyond in everything that you do! I run it from 4-7pm. Some folks like to go home first & come back. Some come at 4 but leave early to make dinner. Some stay the whole time! The number of attendees varies. I can tell you that I just opened this thing up to all kinds of staff & it was truly appreciated! Teachers, admins, office staff, student teachers, assistants….people felt happy to be included! Our Tech Playdate allowed me the time to create several Plickers review lessons one of which I used the next day in class. My second graders loved watching their names change color once their cards were scanned and wanted to see the graphs for the responses. I loved that my students were so excited and actively engaged about reviewing social studies; and that I was able to see who needed more help with certain concepts! Plickers is definitely a tech tool that will stay in my belt! Thanks for suggesting this fun and educational way to learn about some new websites and get some time to play with them too, Kathy!